Sequential Art is a form of telling a story through the use of pictures in a narrative sequence. Comics, cartoons, and graphic novels all fall into this popular category. Strathmore fine art surfaces are now offered in formats to fit every application. Created in 1893, this acid-free, 100% cotton 2-ply bristol is an industry standard. Choose the toothy finish of the Vellum Surface for use with graphite pencil, colored pencil, sketching sticks, and specialty pens and markers. 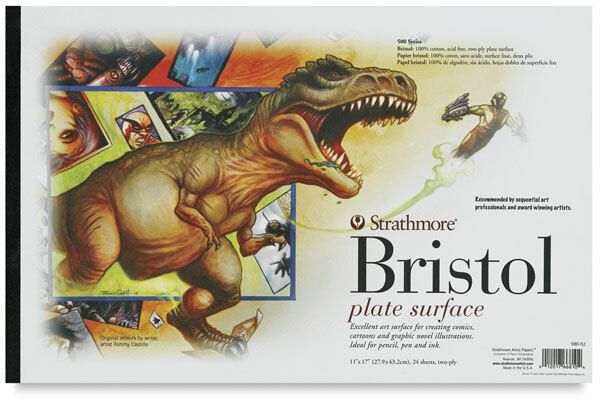 The Plate Surface has an ultra-smooth finish that is ideal for detail work using traditional pen-and-ink tools, specialty pens and markers, and airbrush. The Semi-Smooth Surface is slightly textured surface making it well-suited for pencil, pen-and-ink tools, and specialty pens and markers. Pads and packs each contain 24 sheets.